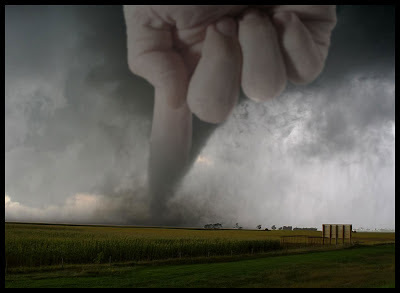 “Why would God reach down his hand and drag his fierce fingers across rural America killing at least 38 people with 90 tornadoes in 12 states, and leaving some small towns with scarcely a building standing, including churches? “Piper’s god is like an abusive father, filled with unpredictable rage. His family must walk on eggshells, afraid of suddenly enraging him. Should he be provoked, this god will lash out with deadly, earthquakes, tsunamis, violence and war." “This theology is, in a word, abusive, for it blames the victim for whatever calamity, abuse, or tragedy she suffers and says it is deserved." "The victims of the Boston bombing got what they 'deserved.'" May God deliver us from all this horrific theology. We pray for all of you in Oklahoma. Lift you up in the Light. and us humans with a story about talents. [The Realm of God] “…will be like a man going on a journey, who called his servants and entrusted to them his property. 15 To one he gave five talents, to another two, to another one, to each according to his ability. Then he went away. 16 He who had received the five talents went at once and traded with them, and he made five talents more. 17 So also he who had the two talents made two talents more. 18 But he who had received the one talent went and dug in the ground and hid his master’s money. Thank God, I didn't behave like the man who got only 1 talent, even though I only did get 1 fairly average talent. But why couldn't life have been all different or even mildly so? When I was a kid, I always wanted to be the guy who was got 5 talents. physics, and Spanish, passing, not failing, but flailing because so disappointed. So I determined, at least, not to be like the guy given only 1 talent who wasted the gift by hiding it. But even here, after much learning, diligence, and long hours of work, I discovered that even my 1 talent was rather average in comparison to my hopes, dreams, and goals. Such is life for many of us. You see, I had dreamed of and wanted to be like Joseph in Genesis, who after many years of trial and labor, eventually became the prince of talent. But Life didn’t turn out that way. No matter how much and hard I worked. Not that I don’t love my penchant and ability with words, images, ideas and concepts that God created me with. I love language, literature, art, and poetry, history, and philosophy. Yes, I suppose some would call my incessant philosophizing and study of history—a second talent, but often that ability seems more like a liability, even at times a curse. Why did I have to be born with “why” as my first word;-)? Why was I at 11 trying to figure out theology and biblical interpretation and ethics while most kids were preoccupied with their bicycles and Little League? For instance, consider all the false worldviews from Calvinism to Atheism, the ones which twist our lives, destroying and wrecking havoc for millions, the ones which I think about and work against. I feel the incessant need (and choose to) study tome after tome and figure out valid reasons why those leaders of specious worldviews are wrong, and then I write thousands of pages explaining so in great depth. And lastly, I seek to point all people to the truth of Jesus the Chosen One, the Image of the Invisible God. ...while in contrast all my relatives and friends wonder why I bother so much over what others think. Why couldn’t I have been born a physicist instead of a philosopher, a plumber instead of a poet? At least then I could have easily paid the bills, dealt more with the hard data of reality rather than the imaginative and the speculative and the incomprehensible. But I trust in God who is love that God can bring good out of my only 1 little talent, far beyond what I perceive. Murray Rose won six Olympic medals, including 4 Gold, 1 Silver, and 1 Bronze and held the world records in 3 different swimming races. Because of his vegan lifestyle, he was nicknamed the “The Seaweed Streak.” And according to a biography written by his father, the meatless health food diet was largely responsible for Murray’s athletic success. As a young adult, I was deeply impressed—I wanted to be very healthy and strong, too. How could emulating an Olympian’s health regimen not lead to a robust healthy life? Furthermore, the main person who opposed my new way of eating was medical-nurse chain-smoker. Obviously, didn't know anything. Besides, the deeper motivation was that a friend, who I wanted to bcome my girlfriend, had just embarked on the vegetarian life. And didn't Genesis speak of a meatless Garden before humans chose to do wrong? So I launched pell-mell into a healthy program of nuts, fruit, vegetables and grains, ostracizing ham, chicken, and beef. Did I become an Olympic star? Hardly. I lost about 50 pounds, dropped down to around 112 pounds at 6’3’’—looked like a pale, bony Gandhi…became malnourished…and so eventually forsook “health foods" living. Oh, and the girl quickly quit vegetarianism, long before me, and dropped out of my emaciated life. So much for youthful error and illusion. How had Rose achieved the opposite? Who knew? Fast-track 35 years forward and I again decided to move down the food levels toward the Garden. Only I was going to do this slowly, not as a fundamentalist convert to "health foods," like in my disastrous past, but carefully and quietly. Thousands of speeches have passed through my ears and countless millions of book leaves--endless writing into my eyes, all mentally swallowed, digested, and then later chewed like the proverbial cud. True, some of all this learning I couldn't digest, couldn't stomach, and so spit out rapidly. Other learning seemed so boring it was forgotten before I heard it. But some writing/ideas/reflections became part of me, like Ecclesiastes says, “well-driven nails” hammered deep into my psyche, truths so powerful they are permanent. One such lecture I heard online several years ago explained there are various levels of commitment for us humans. In the brilliant talk the speaker described the various levels of perception from the superficial to those so inner bone-deep, the ones which go to the deepest heart of things. I am very “low-church.’ Like small group Bible studies, spiritual sharing, active social concern projects, etc. I get next to nothing out of ritual, liturgy, repetition, tradition, hierarchies, etc. All of those latter activities which so enthrall many, leave me wondering, what’s the point? Ritual activities seem outward, superficial,impersonal and boring. So I like loud Christian rock music, lots of worship action, dramatic sermons with visual illustrations, vivid art, inspired communities that meet in shopping malls, not in old traditional spired buildings, etc. But all of these preferences--while 'luv'd dearly'--are just notions, personal likes, subjective enjoyments. I could easily leave them behind if need be, if God called me to a different way. The Friends/Brethren denomination is, in my opinion, the best one to commune with other followers of Jesus. I greatly appreciate/like/admire/think the Friends and the Brethren (Brethren in Christ, Anabaptists, Mennonites, etc.) do represent well/best the Truth. Though these denominations have their own smelly feet historically and locally, too. If a Christian leader could show me there was another denomination closer to the Truth, I would change immediately. That makes the most sense to my limited understanding. But it’s all only interesting speculation. How can any human possibly know or understand the ONE who spangled the Cosmos into becoming before Time? Besides how many hungry children did abstract theorizing ever feed? How many abused women rescue? How many confused teens helped to feel loved? Too often, theological speculation divides and destroys, rather than heals. If in doubt, read a book on Christian history such as Jesus Wars by John Philip Jenkins. The next deeper level of commitment concerns beliefs, some of which rose out of theological speculation. The Virgin Birth. This belief is an important one for Christians and one I used to subscribe to, for about 55 years while I was a committed Christian. Christianity has a very large number of other beliefs which form various Church creeds, but I am not a creedal person, never was a believer in the Christian Church Creeds, didn’t even know of these theoretical abstractions until I reached college. Instead, I grew up in a non-creedal denomination: American Baptist. We were moderate fundamentalists, but primarily concerned, devoutly, with helping every human being accept Jesus as Leader and Deliverer, and then live for him daily, following his ethical commandments. Doctrines only existed to help save humans. But if Christians insist that I must adopt a creed (as many do) in order to be a follower of Christ, I would say while I identified as Christian, that I agreed/held to The Apostles’ Creed. However, that was only a belief, meaning that I held it lightly. If it had been proven by scientists and historians that the Virgin Birth never happened, it wouldn't have bothered me (other than wonder why Scripture claims otherwise/to the contrary). Beliefs come and they go. As far as I can see, all of them or the vast majority of them have no impact, or very little, on day to day living for Jesus. Very central beliefs up the ante to essential doctrines. I trust that Jesus was inspired by God, that God is One, that God created us in his-her image, that the Bible has value, etc. If one of these central doctrines were shown to be false, it would devastate me, leave me confused and uncertain what to think. But, probably, eventually I could experience recovery and move onward in my spiritual journey. However, when it comes to the next level, convincements, if one of these were proven untrue, my life would never recover, at least not to any degree of worth. I used to be committed to the view that Christian faith is the GOOD NEWS to every single human being, that God was in Christ reconciling the world unto himself, because God so loves the world and isn't willing for anyone to perish, that Jesus died for every single person who has ever lived, and for every single person who will ever live, that God wills only what is Good, what is True, what is Loving. But then Augustinian/Lutheran/Calvinistic leaders took over most Christian churches and hark their prove their limited theological determinism as the Gospel. Like Charles Spurgeon claimed and now Matt Chandler, John Piper, Albert Mohler, etc. proclaim. You know the poisonous T.U.L.I.P. of Reformed religion, the one that burned other Christians at the stake, drowned Anabaptists for refusing to baptize their infants, and foreordained most humans to eternal damnation, that slaughtered millions in wars, etc. This version of Christianity claims God has a hidden will contrary to his revealed will. Supposedly, God has two contrary wills! For instance, God really wanted/desired/willed for humans to sin; yes, God secretly plans every evil action and every destructive sin and all for "his own glory" and his own "good pleasure"! It’s all about him. God is ultimately self-centered. God is essentially not love as various Scriptures such as 1 Corinthians 13 claim. Rather God is essentially sovereign power; and God has foreordained most humans to eternal damnation, again for "his own glory." Yes, God even planned the Jewish Holocaust for his own sake, etc. Since Augustinian-Reformed religion has been shown to be what Christianity really is, (beneath the Madison Avenue slick advertising of the apologists)...has been shown to be the "Gospel" (like Spurgeon claimed), that is why I came to realize this year that Christianity can't be true. Yes, I oppose this horrific blasphemous view of God with all of my heart, all of my mind, and all of my soul. Like John Wesley said, I would rather be an Atheist than believe in the Calvinistic view of God which makes God into a moral monster, little different from Satan. Then, there is the deepest level of commitment--convictions, views which shape my inner heart. the GOOD, Truth, Justice, Love are the Ultimate Truths of the universe. If this were proven wrong, beyond a shadow of a doubt, I wouldn’t know how to live. I suppose I would then exclaim, “Even if Love (meaning Altruism, Mercy, Kindness, Cherishing, Generosity, Patience, Meekness, Humbleness, Honesty, Equality, etc.) isn’t true, it OUGHT to BE! That’s how deep this ethical conviction is within me. Much deeper than Notions/Likes, Speculations, Beliefs, Doctrines, and Convincements. Love (Altruism) is Life’s blood. Take away that and we only have a meaningless corpse called humankind, and an indifferent purposeless, absurd universe. (This is a major essay I am working on... which is in process, so I would appreciate any suggestions as to how I can make it better and more lucid. Droning On....Or Singing the Good News? Droning On…Or Singing the Good News? [Consider] “…the story of a little church in Memphis, Tennessee, the “buckle of the Bible belt.” During the ruckus over the so-called “Ground Zero Mosque” in Manhattan, this little church learned that an Islamic center was being built next door so they put a sign saying “Heartsong Church Welcomes Memphis Islamic Center to the Neighborhood.” The Muslims were amazed, and deeply moved, and soon a friendship developed between these two neighboring congregations. During Ramadan the Christians let the Muslims use their sanctuary for prayers since Islamic Center wasn’t finished. This story got world-wide coverage. One night Muslims from Kashmir called the pastor of the Heartsong church to let him know: “God is speaking to us through this man” and “We love you.” The Muslims of Kashmir said there was a little Christian church in their area and they cleaned it, inside and out, and vowed to take care of it for the rest of their lives. What a witness of God's love for everyone that small church gave. Part 5 of my series on marriage as covenant will show up next time.